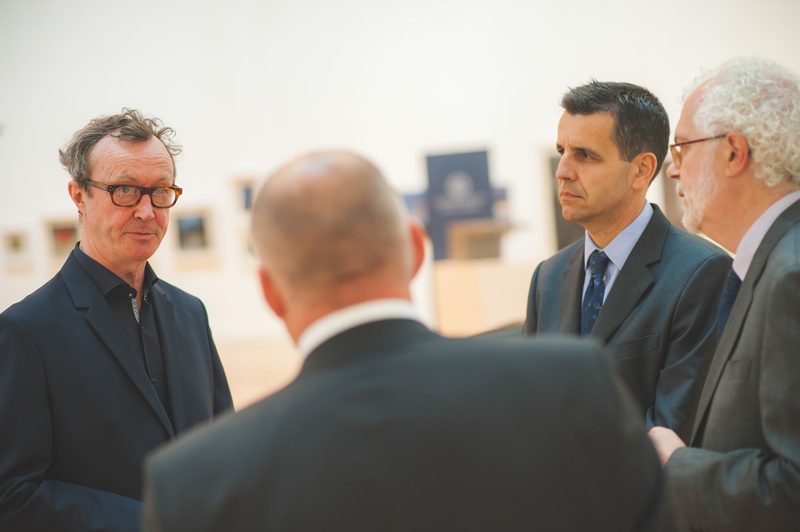 Having photographed various Quilter Cheviot Investment Management events over the last couple of years I was invited along to capture the spirit of the latest Royal Hibernian Academy (RHA) 185th Annual Exhibition for a pre-show viewing in the Gallagher Gallery, 15 Ely Place, D2 on the 21st May. From the 10th to the 11th April just over 1,000 artists left in their paintings, drawings, prints, photographs and sculpture into the RHA for review by 8 members of the Academy whose job it was to select 10% of this overall work for show. To quote Patrick T Murphy (RHA Director) "The 185th RHA Annual Exhibition is like its predecessors, a magnanimous act of inclusion". Having seen the fantastic work which went on show I have decided to submit a piece for inclusion into the 186th RHA Annual Exhibition. More information can be found regarding submissions here. Wish me luck!. The images below were provided courtesy of Quilter Cheviot and the RHA. The first image shows Mick O'Dea PRHA (far left) chatting to Quilter Cheviot executives and Patrick T Murphy.